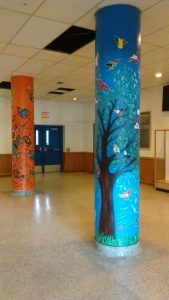 “The theme of our mural was multiculturalism, and it represents one of the two “pillars” of our school – the other being the culture of the First Nations, which is represented in the mural opposite ours created by the Aboriginal Arts class last year. This year’s mural depicts the nations of the world settling in Canada, and living in harmony together. The birds settling on the trees represent the different nations, and the trees have been inscribed with the names of Aboriginal groups which were the first to call Canada home. In painting the flags of the world, we were sure to create an inclusive picture. The 10 countries that are the largest sources of immigration to Canada today were all pictured, including Syria, Iran, and China. We also represented the origins of many second- or third-generation families, with flags such as Poland and Ukraine. And there is a representative number of flags from all continents, spanning the world’s largest countries – such as India, Russia, Nigeria – and some of the smallest (ie. the islands of Palau and Tonga in Oceania). In its later stages, the work became a discussion, as students and teachers alike came to visit us and offered comments, suggestions, or requests for flags close to their hearts! 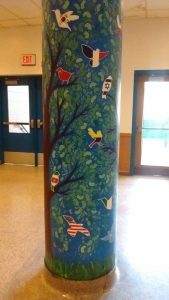 In this way, our art became a dialogue that engaged the students, and gave them a voice and sense of belonging in our school. It was a truly special project, and I am honoured to have been given this opportunity.